The work on Batgirl's bag continues. I pieced the outside panels and made the pleated pockets. I then spread the panels on top of a layer of muslin and quilt batting. All set to quilt! A few thoughts about quilting... Machine quilting is something that takes practice, like riding the bicycle. (Or so I hear, because I still can't ride a bicycle.) For your first project, pick something small where the quilting will be unobtrusive. Use a relatively busy print - mistakes are more obvious on solids. This bag is a good project to try because it is lined, so you can use matching thread in the bobbin and no one will see your messy back or the threads that might pop to one side from time to time. 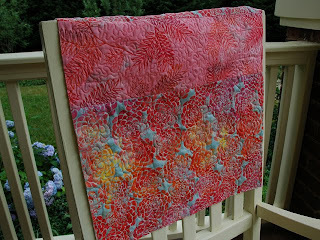 Keep a quilt "sandwich" made of scraps beside you to "warm up" and experiment with. 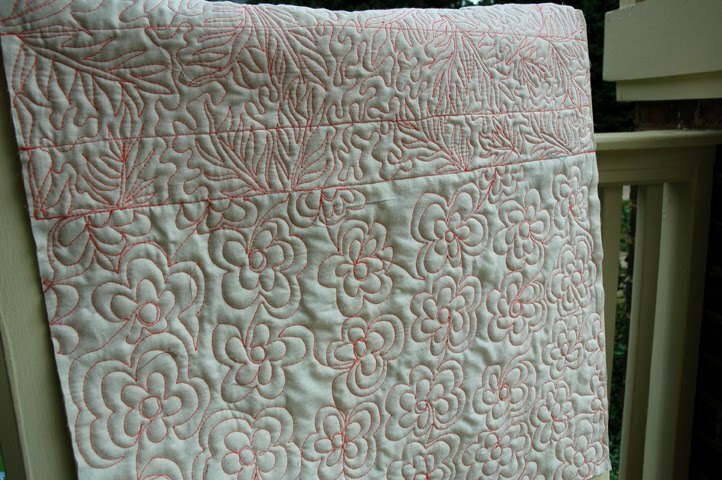 If there were quilting police, they would surely arrest me, but I did have fun. Another thing - threads and needles. Use high-quality thread and a relatively new needle - if you don't the thread may break, and constantly starting and stopping is really frustrating. I usually swear by Mettler silk-finish thread for all sewing. Recently, I picked up a spool of Superior Threads Masterpiece Egytian cotton by Alex Anderson from Ye Olde Forest Quilt Shop in Greensboro, North Carolina, and I am in love. It is a dream to quilt with, even at rapid speeds. Happy quilting, everyone!